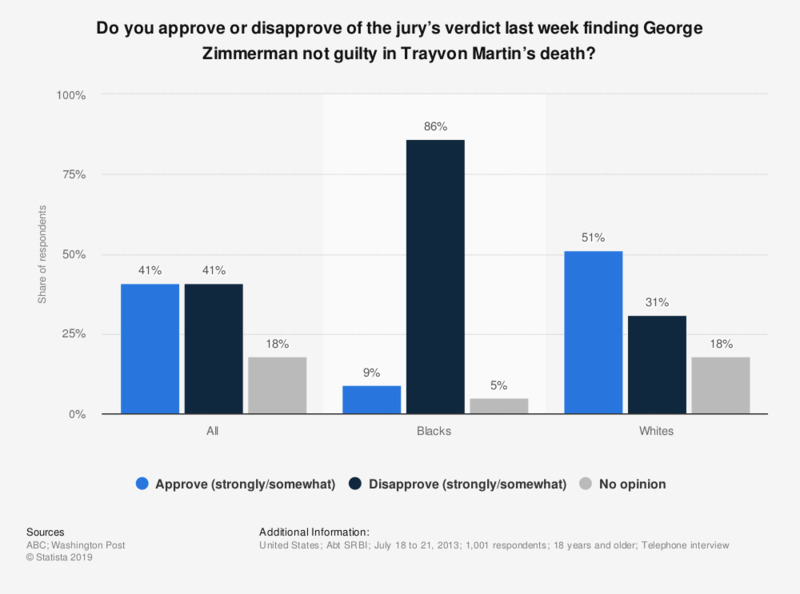 This statistic shows the opinion of Americans on whether they approve or disapprove of the jury's verdict finding George Zimmerman not guilty in Trayvon Martins death. The survey refers to the case in Florida in which the neighbourhood watch volunteer George Zimmerman, shot and killed an unarmed teenager, Trayvon Martin. According to the survey, about 86 percent of the Black respondents disapproved of the jury's verdict. The survey refers to the case in Florida in which the neighbourhood watch volunteer George Zimmerman, shot and killed an unarmed teenager, Trayvon Martin. Zimmerman claimed that he acted in self-defense and that it was a lawful killing, as he felt threatened, making it lawful under the so-called "Stand Your Ground Law". This law allows American citizens to use firearms in public to kill or injure someone in self-defense if they feel threatened or fear for their lives. On July 13, 2013 George Zimmerman was found not guilty of murder and manslaughter of Trayvon Martin. Do you think blacks and other minorities receive equal treatment as whites in the criminal justice system?